Spectra stock cut to hold; can CEO Greg Ebel explain 5 Feb 2015? Maybe fossil fuel pipelines aren’t such a lucrative business after all? Funny how this Spectra downgrade comes right after the big announcement about EPA proposed methane rules. Can Spectra Energy CEO Greg Ebel explain this away to investors three weeks from now? How about OPEC driving the price of gas down and energy deals among U.S., China, and Russia tanking the U.S. LNG export market? Ebel’s got some ‘splainin’ to do. Gone viral and now a big issue in the Florida governor’s race: Broward Bulldog, Tampa Bay Times, Time.com, Florida Democratic Party, WFTV, YouTube, Rachel Maddow’s producer, and Climate Progress, all from the Miami Herald story revealing FL Gov. Rick Scott owned shares in Spectra Energy before his appointees approved its Sabal Trail pipeline. Maybe you’d like to mention this corruption scandal at the Climate Rally and EPA hearings in Atlanta Tuesday next week. And there’s a press conference 11AM this morning at the Orange County Courthouse in Orlando, Florida. 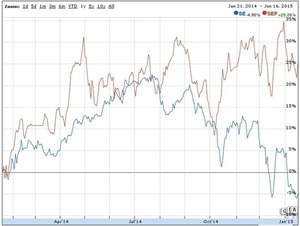 Speaking of stranded assets, let’s compare Spectra Energy stock to SolarCity stock. Spectra (SE) is up about 20% ever, while SolarCity is up 500% in one year. Just like solar stocks in general are vastly out-performing fossil fuel stocks Investors: do you want to make money, or do you just want to trash our fragile watersheds and take property from people who won’t profit at all from Spectra’s proposed methane pipeline? Stock quotes by Google Finance.